So after a great response from my last post about typography resources, I decided to list down resources to make a professional online portfolio. At the end of the day its your work quality which will get you a job or a client but a good presentation is always good. If you are fresh out of school and you have no budget for your portfolio, there are three awesome design communities you can join for free and make your online portfolio on it. Behance: Probably my favourite and one of the most active community out there. It lets you make your profile and portfolio for free. It's totally acceptable to send a behance link as your portfolio to job opening, like sending linkedin page instead of your resume. Also its now nicely integrated with Adobe CC. Dribbble: Its another kickass community, the only problem is getting in. You need an invite to post stuff, I just have one invite left so you can email me your work and maybe I can draft you. CreativePool: I just joined it and it looks quite professional. Really dig the interface and lot of awesome designers and agencies are on it. Krop: It looks really good and professional haven't tried it out yet but I have heard its as good as communities I mentioned earlier. This is different from wordpress.com, It originally started for bloggers and later on transformed into something much bigger. This is free but you need a domain name and hosting which you can get via GoDaddy.com or other numerous hosting places, it will cost you around $50 - $70 Yearly. Wordpress has the biggest cms community which means every problem you run into will have a solution online, you just need to google it! 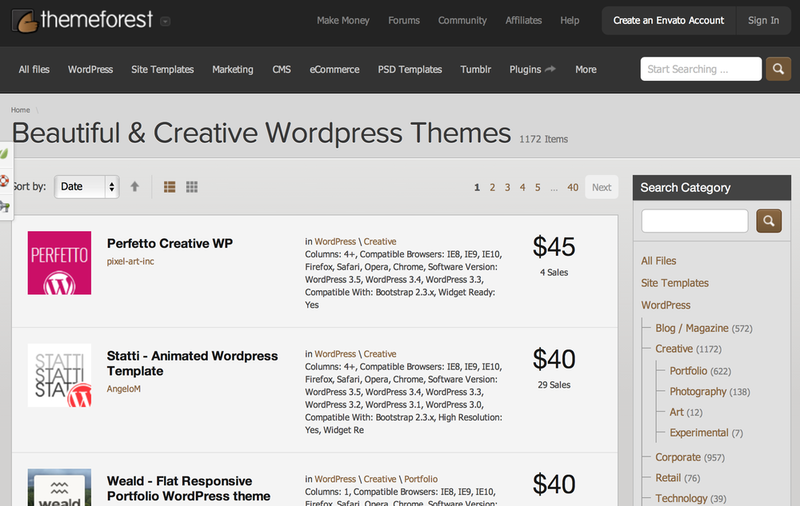 It has a huge selections of themes and the best place to find it would be Themeforest.net or just google "awesome wordpess theme for portfolio"
You can also find free themes and If you are dedicated enough you can learn to make your own theme on TeamTreeHouse.com and there are plenty more resources. I use it on this website and I love it. They have a video on their site which explains all the features, it's totally worth a look. They are the sexiest of all the options available online but they are expensive! $192 yearly everything included. If you are in the US it gives you an amazing e-commerce solution as well. Oh it's responsive and retina friendly. If you are a web designer or you know your html and you just need a CMS to manage things better, Kirby is for you. It provides you bare bones essentials for a file based CMS and you can do whatever you want with it, it's super flexible. It takes your behance account and uploaded work and makes an online dedicated portfolio site for you. There are some customizations you can do but I felt it is kind of limiting but maybe it turns out perfect for your need. Best part it comes free with adobe creative cloud so if you are on behance and use adobe cc go for it, its absolutely free and won't take anytime. It has a great clean look can totally work for you but I should warn you its not super flexible. Do take a look and maybe you don't need more than what it offers. Overall the out come is super sleek. I used it a long time back maybe its more flexible now. I personally don't like using a dedicated blogging service as a portfolio but I know some awesome people (lot of them work at disney) who have kickass work and they use blogger [which I deeply dislike] but what works for you works for you!